Tickets on sale in the Village Hall in the morning, and in our Church in the afternoon. List & descriptions below in green; map at the bottom. We would very pleased to have your comments & feedback, and to help us next time, we would like to know where you came from that day, and where you first heard of this event or where you saw a sign for it. then print it out and display it. On Saturday, 23rd June, 2018, we are holding an “Open Gardens” event in the village. We usually do this every second year, the last time being in 2016. Villages up and down the country hold such events throughout the summer, and they give much pleasure to many, many people. Our event is to raise money for St. Andrew’s Church, Okeford Fitzpaine. It is the major fund-raising event for the Church. Whether you go to Church regularly or not, and leaving religion aside completely, the Church is a village asset and is part of the historic image that we buy into when we move to this village. All too often, the only times some people go to Church are for baptisms, weddings and funerals; but the Church (and churchyard) does need maintenance, repairs, re-decoration and up-dating, and none of those come cheap. It costs us about £20,000 a year to keep the Church open. The Church belongs to the village, and it has to be supported by the village. It gets no funding from anywhere else. Rather the reverse ! For we also have to pay towards the Diocese, e.g. the buildings and staff of Salisbury Cathedral, etc.. The church is currently funded by private subscriptions from a small core of people and by interest from one or two past legacies. This funding is never sufficient and we are consistently in debt to the diocese. For our village of some 800 people, the Church IS a community centre. It is open every day as a place to get away from it all in peace and quiet. After Services on a Sunday, there is coffee & biscuits, and chat with other villagers, and occasional visitors. There is also Morning and Evening prayers every Thursday. If the Church lacks support from the village, it may have to be closed, and we lose this asset. 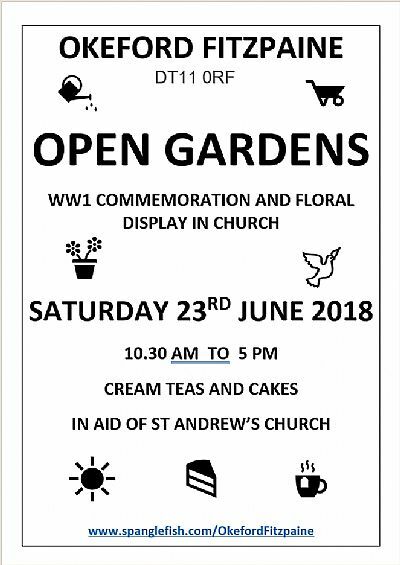 That is why this Open Gardens event is in support of the Church, and why it is so important to the village. There are hints of the church’s Saxon origins at the foot of the buttresses to the tower, when the village, like Fiddleford and Sturminster Newton was owned by Glastonbury Abbey, but held by ‘knights’ on behalf of the Church, as recorded in the 11th century Domesday Book. The ‘new’ church was completed by about 1300, almost certainly by one of four generations of Robert Fitzpaines, the first of whom, according to the Revd. Hutchins in his 18th century History of Dorset, was the grandson of Milo, Earl of Gloucester, probably illegitimately, as the prefix ‘Fitz’ implies. The Fitzpaine family resided in the village for about 150 years from 1246 to about 1400. They were the last resident Lords of the Manor and appear to have been kindly benefactors to the village, having obtained a licence to hold an annual Whitsun Fair that is still a feature of village life and will take place on the Recreation Field tomorrow. The church was remodelled in the 18th and 19th centuries. The font dates from 1866 with possible components of an earlier font visible in the walls surrounding the churchyard to the left of the lych gate. The Early Perpendicular tower of the mediaeval church remains as well as interior and exterior carvings, pillar bases in the south transept, the pulpit, part of the chancel arch, possibly some flagstones and some mediaeval glass in one of the north transept windows. The colourful Arts and Crafts stained glass windows, were created in memory of former Rectors and the wealthy Phillips family, who owned Hill View Dairies and provided employment for many in the village. DISPLAY: “The Butterboys in Battle” to commemorate the centenary of the end of the First World War, with floral tributes, in honour of our fallen heroes. For several years Andrew Vickers, Chairman of the Okeford Fitzpaine History Group, has been researching official records and talking to relatives of the sixteen young men from Okeford Fitzpaine who were killed in the First World War. This painstaking research has been recorded in a book “The Butterboys in Battle” with new information and photographs being added all the time. These lads grew up, played, went to school, and worked together. They joined up together and some even died together. Many played in the village football team, known as “The Butterboys” as most were employed by Hill View Dairy. A new housing development, The Old Dairy, off Higher Street, now stands on the site. The book is a permanent testament to ensure their sacrifice will not be forgotten. We are proud of our new WW1 commemorative bench outside the Okeford Stores, paid for by funds raised by the very pro-active Village Community Group. Please take time to sit on the bench and look at the book, kept in a box at the side of the bench. There is also a copy in the Church. The allotments were started in the Spring of 2009 and have proved a great asset to the village. The pleasant site near the Cookwell stream and mill pond is very fertile, largely thanks to many years of pig rearing and horse grazing. The emphasis is on organic vegetable and fruit production. Church Farm was remodelled in about 1900 and again in the 1960s on the site of a ‘cottage’ that is shown on a map dated 1782 and a survey of 1584 when it was inhabited by Joseph Harrys. The house stood adjacent to the mediaeval manor house, probably built by Robert Fitzpaine, of which only the foundations were visible by 1620, as recorded by Thomas Gerard. There is a fairly large garden divided into mature informal beds with lawns to front and rear. Occupying half the rear garden is a wooded wildlife area and also a pond. The beds contain a range of interesting and colourful shrubs and perennials. Bird feeders, bird and bat boxes, reptile refuges, log piles and food and nectar plants attract a range of wildlife. for recent sightings of the wildlife in this garden. Cloverhayes, the Grade II listed thatched house opposite, was ‘newly built’ in 1584. A mature and loved garden with perennials, shrubs and vegetables, and fine trees. The present owners have opened up an area to the East where they have planted trees, hedges and roses to frame the spectacular views of Hambledon and Shillingstone Hills. The owners have recently constructed a terrace on the north side of the imposing house built in the 1930s, and there is also a productive greenhouse. In 1584 this was the site of a forge, inhabited by Richard Birt. The current owners have been renovating the thatched Grade II listed cottage, largely untouched for 50 years. French doors have been added to the kitchen, and a patio created with original brickwork and artefacts excavated from the garden. The garden was somewhat overgrown but many of the original plants have been kept, and old roses have been complemented with new varieties. 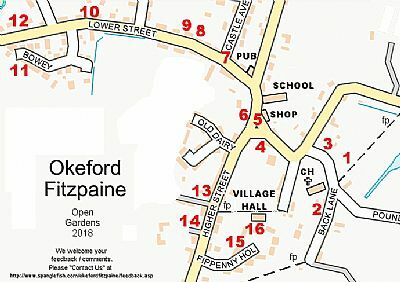 Note Trinity Cottage, St Lo House and Okeford Stores, once The Bell Inn, opposite, each Grade II listed and recorded in 1584. A small courtyard garden with a magnificent chestnut tree, planted in 1968 to replace one planted in 1887 to commemorate Queen Victoria’s Golden Jubilee. The site of the ‘Town Halle’ in 1584, this Grade II listed tbuilding was built in 1837 by public subscription, to commemorate Queen Victoria’s coronation, possibly as a poor house, before it became a school. It was replaced by the village school in 1873. Note the door of the village lock-up on the other side of Higher Street, last used in 1864. Sadly, that occupant died from inflammation of the lungs caused by the damp cell. In the 1584 survey, this was the site of Richard Goby’s village bakery. It is thatched and Grade II listed. The garden is on a slope with unusual plants and foliage. As you move on to the next Garden, glance over the wall of Grade II listed Darknoll Farmhouse with its fine garden. Note the adjacent Hill View Farmhouse and Yeatmans further down Lower Street, both thatched and Grade II listed. A pretty Grade II listed stone cottage remodelled in the 17th century but on the site of one present in 1584, inhabited by Agnes White, widow. A mature, organic cottage garden with flowers, especially roses, currently providing a glorious colour palette. An enthusiast’s garden with raised vegetable beds and a fruit cage. This pretty Grade II listed thatched cottage, on the site of one present in 1584, forms part of the building that housed Robert Young’s shoemaker’s business, operational until the 20th century. His descendants still live in the village and run a haulage business. The ‘Victorian’ cottage garden is a feast for the eyes with a riot of colour from a cornucopia of shrubs, perennials and roses. Another lovely old Grade II listed house on the site of a cottage present in 1584. An ancient gargoyle was dug up in this spacious and practical cottage garden, which has a large lawn, herbaceous borders, roses, fruit, vegetables and a practical ‘leaky hose’ watering system. .As you move on, of interest also are the two Grade II listed thatched houses, Netherway Farmhouse next door and Langstone Farmhouse opposite. Together with her partner Brian, now sadly deceased, the present owner has completely remodelled the garden over the past 14 years. They planted and shaped the beds with existing saved plants and some brought from parents’ home. The owner has continued the work, including enlarging the patio a year ago, to create a pretty cottage garden that has now reached full maturity. A compact garden containing a rich medley of layered shrubs and perennials, chosen for year-round interest. A particular characteristic is contrasting leaf colour held together by a selection of Japanese Acers. Look for Astrantias, Geraniums, Argyranthemums, roses, clematis, salvias, Thalictrums and Spider Day Lilies. A colourful front garden to this elegant modern house welcomes you and then, to the rear of the house, you come upon an area of lawn bordered by flower and shrub beds. Further on there is a fruit and vegetable garden with raised beds, fruit cage and a variety of fruit trees. Finally you come to a woodland area that extends to a stream at the bottom of the garden. There was a house on this site in 1584 when Edward Howe lived here and the Grade II listed and thatched existing house displays mediaeval features. ‘Mathematical tiles’ (brick slips) to the front elevation hide earlier stone walls, either for insulation or to ‘gentrify’ the house. This is a partly walled, practical farmhouse garden. It is a work in progress with flowers, shrubs and vegetable plots. Note the Grade II listed and thatched Nutmeg Cottage next door, formerly The New Inn with licensing records going back to the middle of the seventeenth Century. In 1584 a churchwarden, Mr Henry Reynold, lived in a house on this site. Just past the house is the drive with a side-gate into the cottage-style garden, entirely walled and gently sloping, with an emphasis on ever-changing variety and colour with each season. A small orchard area has several fruit trees and a simple selection of fruit and vegetables. Henry Wakeford lived in a house on this site in 1584. Continuing up Higher Street, before turning left into Fippenny Hollow, you will see Rose Hill Farmhouse on your right, yet another Grade II listed thatched dwelling with its chalk-walled cider house at the south end of the front garden. A house on this site was inhabited by the wealthy John Isles in 1584. Opposite, further up the hill, is the historic Village Pound. No dogs in this garden, please. The award-winning Fippenny Hollow was built in 1984 on the site of a large orchard that formed part of the private demesne of the mediaeval manor house. More recently, there was a Temperance Hall here. Once in the close, enjoy the whole area as a garden in its own right, now at the peak of maturity. The open-plan design with specimen trees and sensitive positioning of each house has created a pleasing ‘arboreal’ garden close. Since 2014 the present owners of No.2 have renovated both house and garden. The front borders are a riot of colour; the private, low-maintenance rear garden has areas of patio, lawn and garden produce. ‘Before’ pictures can be compared with the present garden. The front garden has trees, shrubs and colourful bedding plants and hanging baskets. Through the garage the rear garden has raised vegetable and fruit beds and a large lawn bordered by herbs, shrubs, bedding plants, fruit trees, climbing plants and roses. The greenhouse contains tomatoes, there are home-made compost bins, and colourful pots cheer up the patio. On your way back to your cream tea or tea and cakes at Cookwell (Garden No. 3) take a short cut along the footpath opposite Nutmeg Cottage and past the Village Hall. Admire the little group of thatched Grade II listed cottages in Greenhaye (called ‘the playing place’ in 1584) and imagine you are back in the 16th century, possibly at the entrance to the manor house demesne up the bridle way to your right.